I’ve been thinking about a strange paradox: Millions spending billions giving unneeded gifts to each other in celebration of the birth of Jesus, while He—incarnated in “the least of these” of His family—goes without basic necessities such as food, safe water and adequate shelter. This seems especially strange when those who claim to love Him ignore His glaring needs. We’ve put together this Gift Catalog to help rectify that paradox. 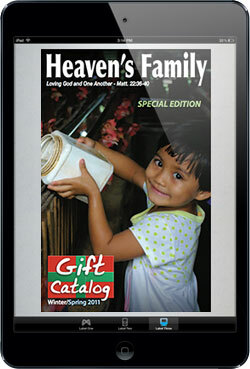 Using it, you can still honor your friends and family with gifts, but your gifts will also express your love for Jesus and lift the very poor among His family around the world. An added bonus is the treasure laid up in heaven as a result, which is the only thing that most of us—givers and receivers—can honestly say we lack. When your loved ones open their gift cards from Heaven’s Family and learn what you’ve done in their honor, they’ll appreciate your kindness and farsighted wisdom.